The versatile Marantz AV8805 pre-amplifier redefines the audiophile home cinema and music listening experience with an unprecedented 13.2 channel processing capability, and support for virtually any high-resolution multichannel audio format. With the latest surround formats like Dolby Atoms, DTS:X or Auro-3D you can also immerse yourself in the wonder of three-dimensional audio. This enhanced audio quality is made possible by our proprietary current feedback and HDAM technology that passes signals through a 15.2 channel XLR or 15.2 RCA output. To top it off, you can also stream music throughout your home with HEOS multi-room listening and full wireless connectivity through the HEOS app, supported by Wi-Fi, Bluetooth and Apple Airplay. With the Marantz AV8805, you get incredible fidelity and unparalleled audio precision. The Marantz AV8805 offers an outstanding construction for the best, unaltered music and movie playback. 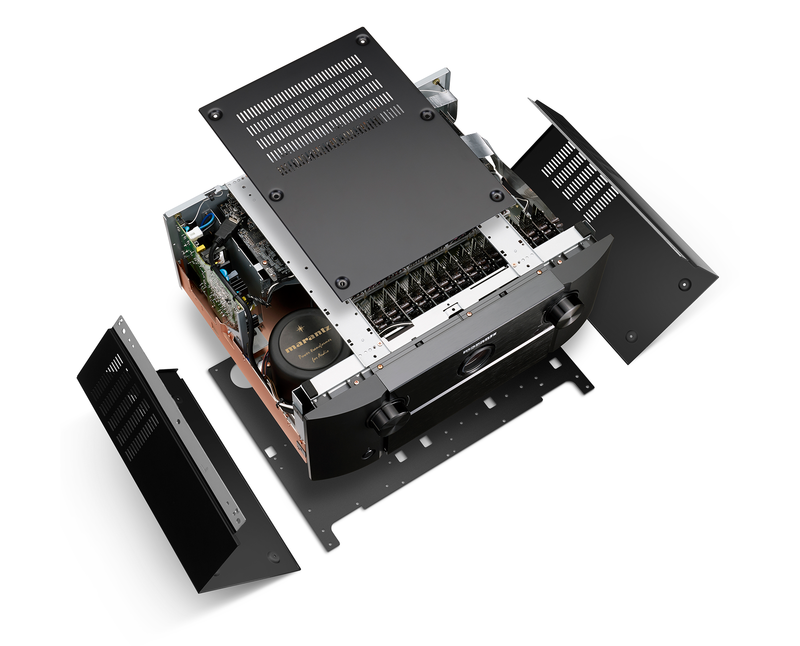 The highly rigid base chassis - the foundation for all circuit boards carrying the sensible audio signal – leaves no chance for microphonic effects through unwanted vibration. The oversized toroidal transformer feeding the big main capacitors is set on an extra 5mm aluminium pedestal for extra stability. All electronic is supported by the copper plating on the main chassis which guarantees best ground connection at any point and improves Signal to Noise behaviour significantly. In total 17 single board HDAM modules are used to achieve best channel separation for reference-setting audio performance. Finally, everything is covered well by a heavy top lid constructed out of three pieces. The Marantz AV8805 is future-compatible, with the latest HDMI and HDCP 2.2 specifications on all eight HDMI inputs. The pre-amplifier supports 4K Ultra HD 60Hz video, 4:4:4 Pure Colour sub-sampling, High Dynamic Range (HDR) and 21:9 video, 3D, and BT.2020 pass-through on every input. It is compatible with 4K Ultra HD Blu-ray disc players, set-top boxes and other 4K Ultra HD sources. Dolby Vision compatibility, HLG (Hybrid Log Gamma), new HDR format for broadcasting and pass-through capability are also supported. DTS:X™ immersive audio places sound where it would occur naturally in space, creating a lifelike, multi-dimensional audio experience in the home. The included spatial remapping engine of DTS Neural:X™ offers improved immersion and heightened realism in all your favourite movies. Featuring Bluetooth and Wi-Fi wireless streaming connectivity, the AV8805 is equipped with an advanced dual antenna transceiver system for robust streaming even in congested urban environments. Plus, with Apple AirPlay compatibility, you can enjoy listening to your favourite audio content wirelessly from your iOS devices such as an iPhone or iPad. The AV8805's built-in HEOS technology allows you to stream and play back your favourite music wirelessly from a huge variety of sources. Enjoy music from Spotify, TuneIn Internet radio, Sound Cloud, Tidal, Napster, Deezer, or your local music file libraries. With additional HEOS components like the HEOS speaker range or other HEOS-capable receivers, you can play all your music throughout the whole house and control it all effortlessly with the free HEOS app. The Marantz AV8805 features eight premium grade AK4490 32-bit stereo DACs on all channels and XLR input and outputs. There's a balanced XLR stereo input that's assignable as well as 15.2 balanced XLR outputs, which includes the two subwoofer outputs, front height/width outputs and overhead channels. This extensive balanced XLR compatibility ensures high-end performance in the home and the studio, while 15.2 pre-outs (RCA jacks) provide additional compatibility with multiple power amplifier types. Equipped with the full Audyssey Platinum suite of advanced DSP algorithms, the AV8805 features Audyssey MultEQ XT32 automatic room acoustic correction. With the supplied measurement microphone, MultEQ XT32 analyzes each speaker's output (including the subwoofers) at up to eight measurement locations and generates precision digital filters that optimize each channel for the correct frequency and time domain response. Plus, the optional Audyssey MultEQ Editor app lets you view and adjust settings for detailed tuning and customize the sound more precisely to your room and tastes. For remote control compatibility with other components in your home theater system, the AV8805 features an IR (infrared) remote control input and output on the rear panel, along with dual 12V trigger outputs. For direct connection to external home automation and control equipment, the AV8805 features an RS-232C serial port and Crestron Connected certification for quick and easy integration with Crestron home automation equipment. The AV8805 has four Smart Select buttons on the remote control, each of which store a preferred setup; input, volume and Audyssey configuration – for a particular source. Push one button and the AV8805 can be perfectly configured for anything, from Blu-ray or your TV set-top box to your favourite Internet radio station.